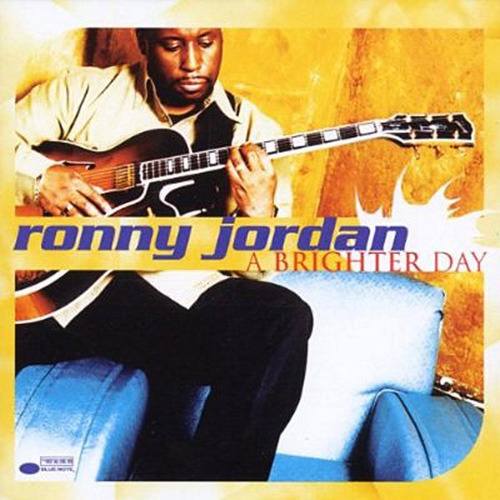 A BRIGHTER DAY was nominated for the 2001 Grammy Award for Best Contemporary Jazz Album. In the early-'90s acid jazz scene, stylish Brits like Brand New Heavies and Ronny Jordan experimented in fusing jazz with elements of funk and hip hop. On his Blue Note debut, Ronny Jordan displays an expanding vocabulary of smooth jazz talk and world beat accents without sacrificing his funky, streetwise slang. This self-taught guitarist breezes into the "Mambo Inn" for Latin spice, over to "New Delhi" for an acoustic Middle Eastern rendezvous, and on to a beefy B3 organ BBQ that grounds his mellifluous guitar flow on "London Lowdown," with the ease of a jet-setting, six-string seducer. Guests at the party include Roy Ayers adding his intoxicating vibes to a champagne-chilled cover of his own "Mystic Voyage," renowned drummer Jeff "Tain" Watts giving "5/8 Flow" its straight-ahead Brubeck-like kick, and rapper Mos Def dropping rhymes over DJ-Spinna's remix of the title track. The acid jazz craze may have fizzled, but Jordan keeps pouring smoothies from his golden-toned guitar blender that have enough adventurous flavors to satisfy.